Heya girlzz.. How was your valentine's day celebration ? 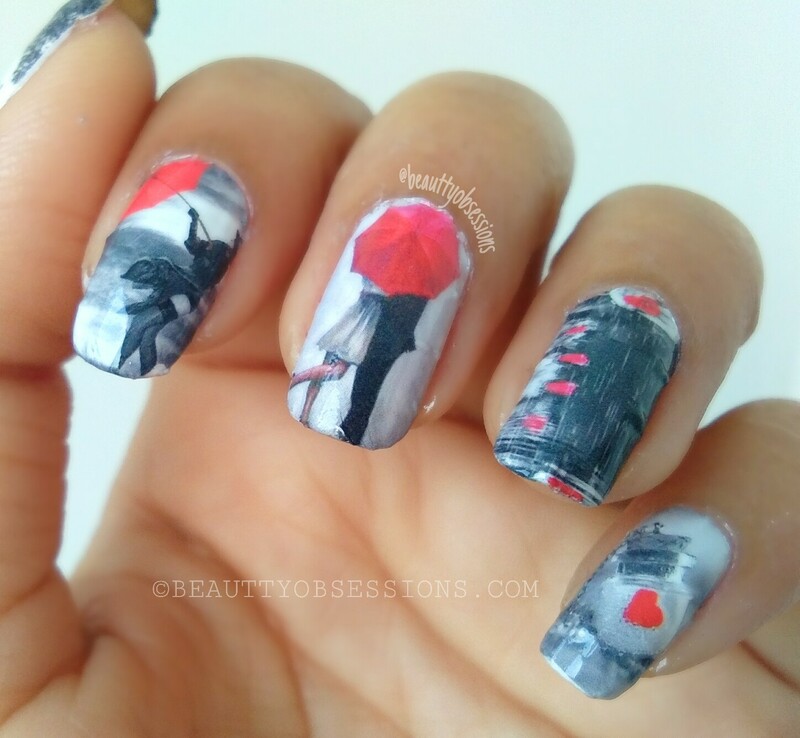 I am sure ,you had enjoyed a lot.. You might be wondering by seeing the heading of this post.. You might also be thinking ,why i am sharing valentine's day inspired nailart after the day gone ? You are true,I was supposed to share this post yesterday but i couldn't because of some other work .. Then thought this month is the love month and it feels like love is still in air and will stay for the whole Feb month.. don't you feel so ? 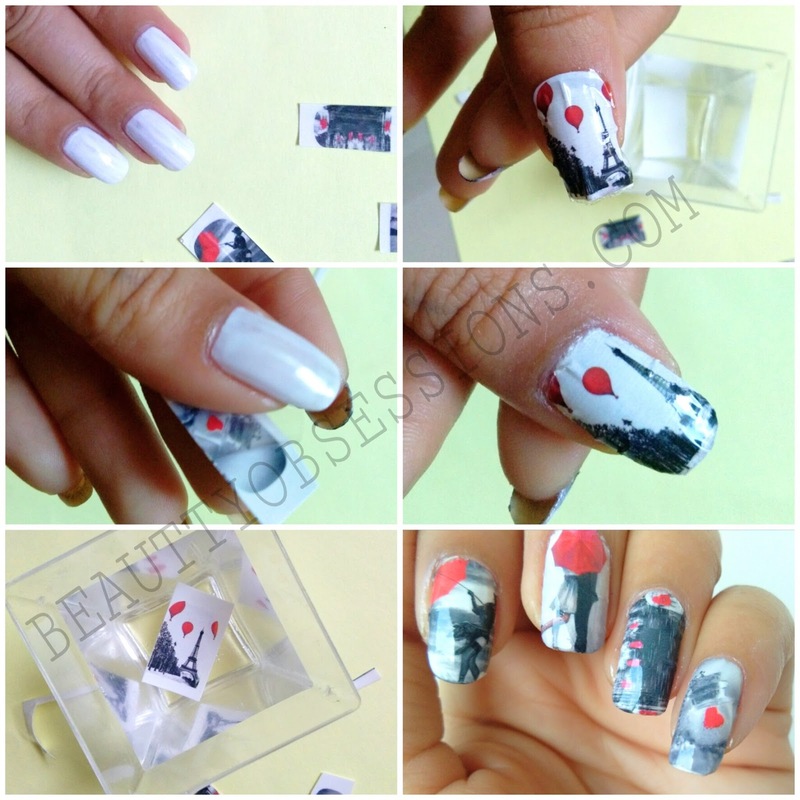 So let's jump into the beautiful nailart inspired by LOVE . 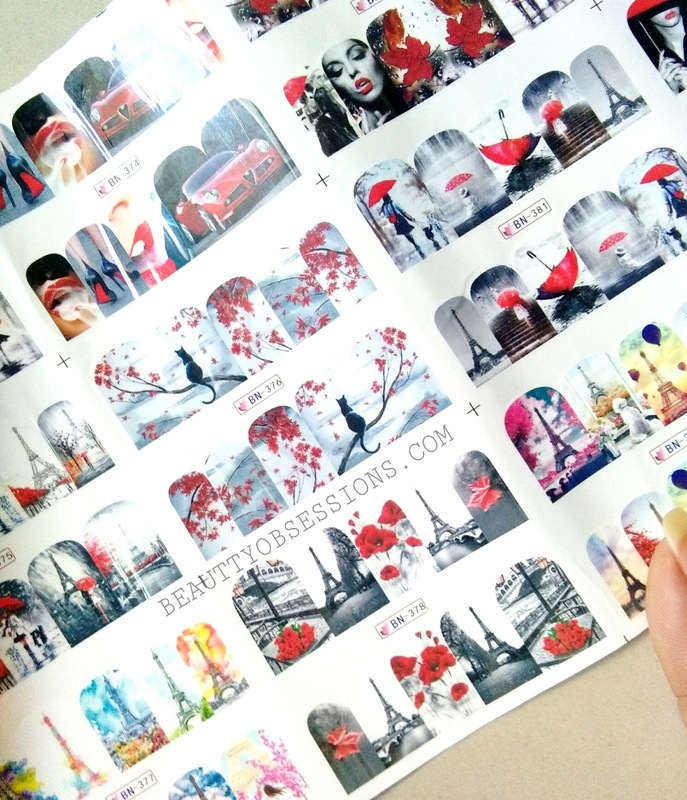 Here i have used the Couple Eiffel Tower theme water decals from my favourite beautybigbang.com . This is a huge sheet with 12 patterns in it. Just have a look at the sheet.. I am loving all the designs.. It looks so romantic on nails . I am loving using water decals these days.. Have you seen my floral nailart using such decals ,if not then read HERE. 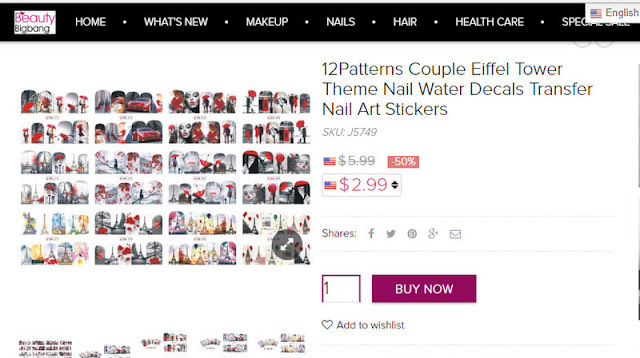 Beautybigbang has such awesome nailart stuffs,one should definitely try out .. And don't forget to use the coupon code SNIG10 to avail extra 10% off across the site.. Now jump into the tutorial. Refer the above picture for better understanding.. Here i have used white as a base colour ,you can also take black or grey as base colour too. Then cut the desire design and remove the transparent film over it . Now drop the decal in water and after 5-10 seconds, bring out the decal from water .Now gently remove the pattern from the sheet and carefully put on wet nail . Then arrange the decal on nail with a very light hand and allow to stick on nail properly . Now take nail remover through a wide nail brush and clean the extra decal outside the nail.. Now allow it to dry properly and at last apply generous quantity of transparent top coat . TaDa😀....you are done.. Now follow these on every nails..
Wow, these look gorgeous.. like a painting on the nails!! 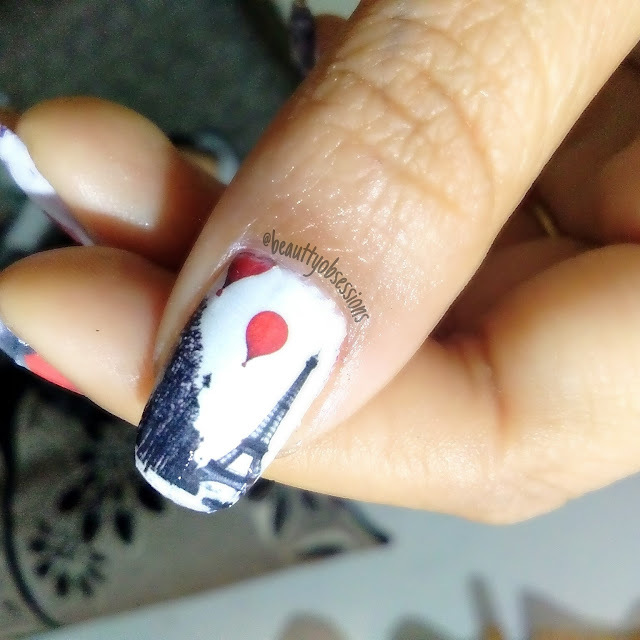 Awesome nail arts, I so much wanna get that Eiffel tower art now, Thanks for this Snigdha! Getting obsessed truly. love the nail designs! looks so festive and stylish! Wow I would certainly love to have these beauties. They look great and very easy to use. They are gorgeous and so simple to make. I would love to try and let you know. Beautiful designs, especially the ones with the umbrella. Aashiqui pose, love is definitely in the air! I'm so intrigued to try this now. 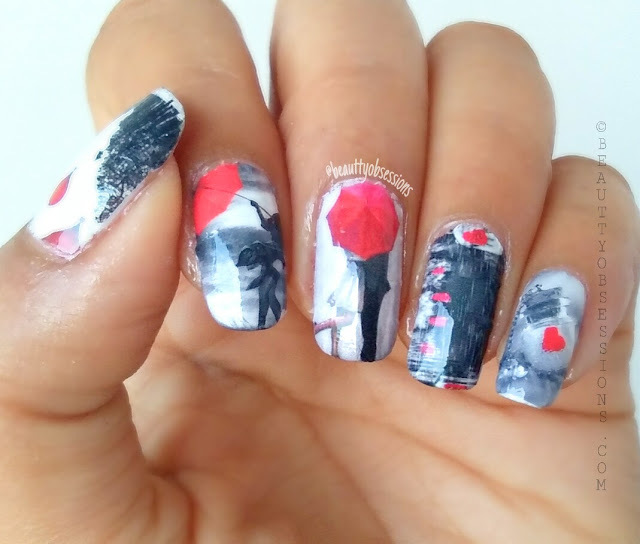 What a beautiful nail art this is. Thanks for sharing about this. YOu have great talent! I love your nail art! Oh my god, such cuteprings, surely giving this one a try! 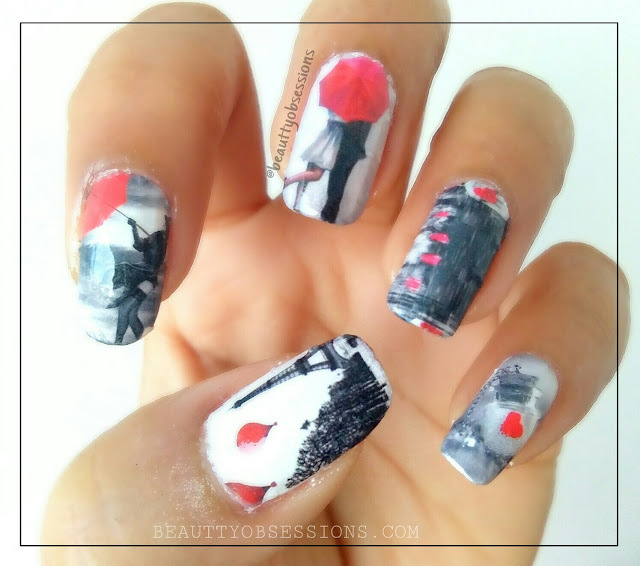 I have always been a great fan of the wonderful nail art that you create. This one beats them all. Beautiful it is. So loved this one. Thanx for sharing such easy way to do nail art...i would definitely try it. Your nail art is always something to look upto for. Love the way you create magic on nails. oh, my!! Your nail art looks really awesome. I really want that for my nails.